"lead intent but not very effective"
had used infer in my last companies. The product is nice and when it works it helps a lot. But the problems come when your model is not working, the support team seems very ill equipped to do anything in that situation. We tried everything infact were also connected to one of their lead data science engineers but the peformance did not improve. The engagement size is big and complicated hence its not an easy plug and play solution to drop if it doesn't work for you. You are stuck with an annual contract with a product delivering light insights at best. as mentioned above when it works well it continues working well. If a model doesn't perform then they cant do anything about it. We tried everything and just left the engagement alone as acting on those insights would have caused us more harm than good. only enter into a contract when you are convinced the product works for you. Not only should you test your model for the existing data but also for any changes you are planning to take up in the future. Once you are in there is no easy way out. Convince yourself fully before committing. account based intelligence for targeting. "Great for identifying high value prospects, but company is changing post-acquisition"
Infer has helped our sales team spend time where it matters most - on high value prospects that look most like our target customers and our current customer base. This saves significant time. Customer service has degraded as most of the folks that we used to work with left as the company got smaller and after they were acquired. Also, product development seems to have slowed, and we now have a number of other tools that accomplish the same goal at a lower price (i.e. HubSpot's scoring tool accomplishes the same goal and yet we get a ton of other functionality for basically the same price that we are paying Infer). As a result, we're leaving Infer after our current contract ends. Our sales resources are extremely valuable, and we want them to spend time on the leads that will be most impactful. The team is amazing to work with. Infer also allows us to optimize marketing spend and prioritize accounts quickly and efficiently. Given the amount of leads that we have, the time savings here is worth the investment alone. Setup and implementation time is a bit tedious. The blackbox model is a concerning because we don't know what the model is being based off of, but they seem to be improving on that. Implementation and trial setup is tedious, but stick with it. ABM prioritization. Qualify and disqualify leads more quickly so that we can get more revenue more quickly. "Very good lead scoring system. " professional team with good support for the algorithm. they have changed it every 9 month, and it just keeps developing. try it. they did an amazing trial scoring for us. We're solving the SDR capacity issue. I like knowing what the chances of a success are going to be when I am working a prospect or deal- I can go use my efforts in the right place. "Directional intelligence, not a silver bullet"
Great way for SDRs to prioritize lead follow up. This is a bit of an unfair complaint, but as good as the modeling is, it's never perfect. Sometimes, D leads will convert at a better clip than A leads. This doesn't happen too often, but when it does, it really undercuts SDR confidence in the product. An automated way to achieve proper lead prioritization and follow up. We have achieved this, and it's led to more efficient SDR processes. "Great lead scoring and predictive analysis model." Ease of use and simplicity in scoring. The model is dummy proof. Could have more predictative analysis crawlers that could be uploaded to SalesForce. Allows our sales people to use a sniper type approach rather than shotgun and Infer employees are easy to work with. Infer allows us to be smarter with our marketing efforts and our sales team's time. With it, we're able to optimize marketing spend, measure marketing performance sooner, and help our sales team be more efficient. The team is also wonderful. I've never experienced such a tailored demo and a sales team that actually understood what we were looking to accomplish. More over, the success team is extremely responsive and did a great job training the team. *Have a plan for how you're going to use it. Identify multiple use cases if you can. *Get buy in from the team. It's not a cheap investment, but if everyone's on board and you really use it, it's worth it. *Optimizing marketing spend. Using Infer, we were able to identify programs where a majority of poor quality leads were coming from. We then were able to dig in deeper and see what those leads had in common (in this example, it was country). Through this digging, we were able to hone in our targeting, reduce spend, and drive up lead quality. *Measuring marketing campaign performance immediately. We don't have to wait for sales cycles to see how deals play out. We know almost immediately if a program was a smart marketing investment. *Prioritize the sales team's time. We weed out Ds from their view, and they prioritize their day based on scores. *Enrich our database. We also use Infer Smart Signals and Glance to enrich our data, which allows us to be more targeted in our marketing campaigns. Our lead quality is at an all time high. The sales team even acknowledges it! "Infer Predictive Scoring & Account Acquisitions"
Still just wish we had a more robust mechanism for using Tasks-SLA enforcement. What they had started to create was a very basic version of SFDC tasks I was hoping for something a lot more robust -- not a major deal breaker or anything but it was a cool concept that would've in my mind worked not unlike Outreach.io for next steps. Generally liked their product roadmap. I know they've had some internal team changes so I'm interested in learning more about what's to come there. Infer enables us to do marketing right and manage lead-nurturing efficiently. We integrated Infer predictive analytics with our content management system (DNN Evoq) and CRM systems (Salesforce and Marketo).It is a critical component of our marketing technology stack. I would be TRULY honest and I am not paid for completing this G2crowd review. But, there is nothing I dislike. They have amazing customer support. At DNN, we wanted to extract the most value out of every intent-driven signal from the buyer’s journey. However, because the buyer’s journey is comprised of many of these moments, we had difficulty analyzing what actually affected leads, opportunities, and sales conversions. Infer, a predictive sales and marketing software, has enabled us to bridge the gap between marketing-advertising and data science. We have achieved great results, increase the lead-to-opportunity conversion rate, boost our ROI, and definitively perform marketing activities by focusing our investment on buyers who are most likely to buy. Infer has done a great job of providing accurate predictive scoring of our leads - we evaluated it against a large data set, and also compared with their competitors, and they did the best job of being able to accurately predict which leads would be most worthwhile. Honestly there isn't much that we dislike right now, so can't really answer anything here. Definitely give it a shot and let them build a demo model for you - we did this and it helped make the case for Infer. We also had some of Infer's competitors do the same thing, and were actually surprised to find that Infer was able to do a better and more predictive model. Biggest problem we've had is that we've had more leads coming in that we had salespeople to contact - we weren't prioritizing our best leads, so were spending too much sales efforts on leads that wouldn't close. With Infer we've been able to focus sales calls on best quality leads and seen real world tangible benefits. Also has been very helpful on the marketing side, as we can now use Infer to see the quality of leads as they come in, rather than waiting to see what happens with them. The predictive capabilities, when fine tuned, can be wonderful. If someone internally does not refine over time, it can quickly become misaligned with customer profiles. Building out lead scoring in your marketing automation might do the trick, if you do not plan to actively engage with the software, on an ongoing basis. Capturing and using many data points about leads that are much higher predictors of buying than firmographic information. "Strong tool, few things need tweaking"
"Totally Promotional experience with Infer." I really liked our account manager and the time and dedication she spent to get things up and running for us. The unforeseen problems that we had were kind of a pain, however, we have a very custom instance of Salesforce so I don't think this helped things. I think Infer is a great way to qualify leads and segment customers. I would caution new users to inquire how this may effect their current Salesforce fields as we ran into some trouble with the implementation, but the support team was excellent to work with and easily got all of the problems resolved. Getting a better handle of the customers who are more likely to convert, and treating these customers with "priority". We are currently handling the A leads first and making sure we get to these before any other leads. "Infer for SaaS eCommerce B2B"
The Infer team is very helpful and knowledgable, and takes the time to understand unique systems and business needs. I can't think of anything I dislike at the moment. Improving/optimizing database segmentation and sales efficiency. "Infer has helped us reduce time spent on junk leads and optimize conversion rates. " First, Infer's methodology to determine fit score. Second, Infer's sales and support team are simply incredible and go way above and beyond. Third, as a tiny startup, they gave me tons of features at a huge discount that enabled us to get approvals and ROI quickly. Takes some time to set up and get implemented, but the support team was there and helpful the whole time. I think my time constraints were the biggest blocker to our implementation! Take advantage of their very helpful support staff. They are willing to walk you through every problem and solution and determine the very best method that you could implement to improve you lead flow and net new revenue. When comparing to a competitor, two things stood out: their methodology was far superior and their team was much more knowledgeable, helpful, and enthusiastic. Oh yeah, and the price blew the competition out of the water! Sales and sales development efficiency has greatly risen where they used to spend way too much time on leads that didn't turn into revenue. Easy to read interface shows me relevant information about the end client such as company size, revenue, and facts about the website. This helps give us an insight on the quality of a lead. With their predictive analytics and lead scoring, we have focused our efforts and increased the lead to opportunity ratio. "Excellent predictive platform, but you need to have a plan for how to use it"
The lead and account models we have with Infer work very well to help us focus on the best leads and accounts in our CRM. The UI is intuitive, and the platform is easy to use once you get used to the concepts of predictive analytics. I particularly like the ability to create lead and account profiles based on any firmographic and demographic data in Infer as well as any fields in salesforce. These profiles can then show up in salesforce to run reports and create target campaigns. Lots of potential there. Very occasionally, an account that would clearly be an A or B isn't identified by Infer, but this only tends to happen when the URL field in salesforce is empty. It's really more user error, but it would be nice if the matching algorithm was more robust. We've been using Infer for about 6 months, and it's really helped to prioritize leads coming in from a variety of sources. The models have been very accurate concerning which opportunities were likely to close, so we feel confident focusing on those more now. Infer is the first tool in a transition to a full-blown account-based marketing stack. Without Infer, we'd be much less confident making that transition. "Using Infer for Inbound Lead Qualification"
Infer has freed up a lot of my Marketing team's time when it comes to qualifying our inbound leads. With several thousand new leads coming in every month, it used to be a 10-15 hour/week process to sift through those manually qualify those for our sales team. The time savings alone provides a lot of value. Switching to a new marketing qualification system was a big shift for our sales team. Where before we were handpicking ultra-targeted leads to pass over, we're now passing over a higher quantity with slightly lower standards. Not knowing exactly how the predictive model works and which signals it looks for can be uncomfortable, but that will be true of any predictive sales platform. A silver lining is that we're now passing over leads that potentially would pass sales qualification that we would not have passed over under our strict manual process. Establish a very specific suite of pre/post metrics for evaluating Infer internally before rolling it out fully. We've been able to drastically change how our sales team prioritizes leads in a way that's less based on intuition and more grounded in data. "A fantastically accurate, useful tool that has given us some great insights"
I have found A/B/C/D grading to be incredibly accurate and reliable, so we have really started to get great insights not only into the quality of the leads we receive but which accounts to target. It is being used across the business is a multitude of ways to see how we are performing and who should be our outbound targets. Tomoko, our account manager has been fantastic as well and is great at explaining the product to our users! Not really dislike, but I'd love the smart signals to be more comprehensive, but obviously that it reliant on the data being readily available, which I appreciate it can't be easily. Great technology and customer service! The scoring is essential when it comes to aligning marketing and sales. They know who they should be reaching out to first and giving the most attention to after we send out marketing emails and content. Love our account reps with Infer too. No dislikes with Infer. Enjoy working with the Infer team and using the technology. We are solving who to contact first and pay the most attention to when prospecting. "Insightful, dynamic, and intuitive. Hugely beneficial to our sales team." Infer allows our sales team to quickly and accurately make determinations about the validity of a potential account. It reduces the time needed to research through lots of different tools and allows our team to identify the best possible opportunities in our pipeline with ease. I would highly recommend this to anyone who is currently trying to scale a new sales team, (as we are), or increasing the efficiency of an existing one. I have no complaints as of yet. All the feedback I have provided the Infer team has been quickly processed and implemented. My only suggestion for future functionality would be a self service console within the app to allow the user to tweak the optics of their Infer Grades on their own so as to not have to bug the Infer CS team to do it. Jon-Michael and Tomoko have been outstanding to work with. Their attention to detail and responsiveness alone has earned my trust, on top of the fact that the product simply works. We use the tools primarily to prospect for new business. It allows us to bucket our most favorable traits for a potential new customer and that cuts down on our prospecting time immensely. Also by using the P2 solution we are able to create really valuable profiles on a rep to rep basis using their behind firewall tech which contains lots of information we do not have access to in our CRM. "Great predictive scoring tool for both Marketing and Sales"
We were really impressed by the accuracy of their according capabilities, helping both sales and marketing to prioritise prospects and leads to achieve greater conversions. The validation it takes sometime until optimising the model, but this is que common on these type of tools, so do not expect to bring full value in less than couple quarters. Better prioritisation of both leads and prospects. More focus and ultimately more revenue. Nitro has a relatively unique problem amongst B2B software vendors - since we sell both B2C and B2B, and since a trial of our point solution is often used to solve a specific problem that a prospect has with a single document, we have a very high volume of top-funnel interest that isn't a good fit. We use nurture campaigns to filter this down, but the time to qualify leads this way can lead to late calls from Sales. Infer helps us cut the universe up, and prioritize which inbound leads to call. Our CSMs, originally Nikhil and now JM, are awesome. Nothing major. Predictive models can struggle when moving into new markets, or launching a new product, but the Infer Customer Success guys are great at providing model-building strategies and ways to cut/restrict/emphasize certain signals in the model such that it accommodates these business strategy shifts well. Product demonstrations don't necessarily show all the differentiation Infer has to offer - focus on evaluating the company, the engineers, and ensure you meet the people who'll manage your account on an ongoing basis. Infer EXCEL at this stuff. We primarily use Infer to filter our top-funnel, secondarily to prioritize leads for followup (we have in the past had different SLAs based on Infer score, and currently require SDRs to prioritize leads based on Infer Score), and thirdly for scoring accounts to prioritize account based marketing. "Infer is the Gold Standard for B2B Predictive Marketing"
We’ve been an Infer customer for the past few years and I love how we continue to find new use cases for the technology. The technology is super-lightweight and bit by bit we have started to add their predictive intelligence to other pieces of our stack like our advertising and email nurture programs. On top of having the best product core in the industry, the Infer team really knows their stuff. Nitro has a pretty complicated environment, and their team has really treated us more like a partner than a customer to make sure we are seeing value from predictive analytics. There’s not much to complain about, there tech just works. I am excited to see Infer grow their integrations ecosystem beyond CRM & MAP to include more advertising, BI, etc. Nitro generates hundreds of thousands of leads per day, and while this is a “champagne problem” it’s important that we understand which our of programs are generating the best leads. Our PDF to Word conversion service is very popular for example, and Infer helps us find the best leads in a sea of prospects that are poor fits, usually folks that just want to use our service once and will never buy. Infer has helped us exercise our advertising spend and make sure we are not wasting budget on channels that don’t attract the right types of buyers for Nitro. With their predictive lead scoring, and account-based predictive scoring we’re able to focus our budget and energy on our high scoring leads that make up 97% of our overall wins. "We've used infer to replace our fit score"
They have been great to work with. We feel confident that they are using the latest data and statics in building our algorithm. We currently only use the fit side of the equation, would love to be able to hand off the whole lead scoring practice to the team. Using their core product, it isn't a full replacement for lead scoring. But a supplement to it. "Infer helps my Sales Development and Sales team work the most valuable leads." The people behind the predictive models make it valuable to me. People at Infer are smart, responsive and answer questions I have from technical details to simple training items. Good people with an amazing product. I'd like to dig deeper in the model. With Infer's new offerings (profile management) I am able to get deeper into the model and make better decisions. If you have been using lead scoring in Pardot, Marketo or Eloqua you are doing a good thing. If you have seen a repeatable sales process (30 to 100 customers) it is time to look at a predictive lead scoring product. Lead scoring is important to guide Sales Development and Sales teams on who to spend their effort and time on. Lead scoring has evolved from eye balling leads to demographic and behavioral scoring in marketing automation platforms and now predictive lead scoring. Predictive lead scoring is the most advanced way to ensure your reps are spending time on the right leads and your marketing efforts are going towards the right campaigns. The product works as advertised and the client support is some of the best I've ever experienced. Takes a while to prove out ROI, but a none issue if you have the time. Focused efforts based on lead score resulting in revenue lift. "Solid Model, Involved Team, Evolving Product"
Infer has done a fantastic job of productizing predictive analytics over the course of the past few years and the implementation team really knows their stuff. They took the time up front to listen and integrate my feedback into a model that has proven to be very predictive. The base product writes a Fit (demographic) and Behavior score to each lead/contact/account in SFDC but they also have a portal of their own where you can dig into the predictive Fit attributes. That said, they are not resting on their laurels. Recently, Infer released a product that will review your spreadsheet of leads and assign a Fit score before you even put them into your database. Another exciting tool coming down the pipe is the Infer Profile Management Platform which will potentially allow users to discover the most predictive combinations of attributes (profiles) and then target those users with messaging specific to their traits. Looks like there may be other features coming to this tool as well. I would like the behavior model to run real-time because by the time Infer recognizes that a lead is hyperactive, the activity has already calmed down and they are off of our website and on to another. In addition, I look forward to them adding new data sources into the model that may be even more predictive. We have used Infer to replace a relatively sophisticated automated scoring system in Marketo. We still have that program running as a backup (and to help with the hyperactive leads issue mentioned above), but Infer is now our primary means of MQLing leads for the sales team. We will also be using Infer to help us select accounts to focus once we transition to a more account-based approach. Without going into too much detail on our specific numbers, our A, B, C, and D leads convert at rates we were expecting when we signed the initial contract. "Infer accelerated our sales team in major ways"
Infer dramatically helped our sales and marketing team focus on the deals that mattered. For me it really struck a chord with marketing because we would know within a few hours after launching a campaign if it was attracting the right type of leads. I know most people use this for their round robin of leads, we did too, but the power it gave us to change and optimize was crazy. Our problem was too many leads, I know, High Class Problems. Either way, too many leads can be hard since you want to make a good impression on everyone. Our team set up an automation flow for the bad leads and had sales reps contact the good leads. this had a huge impact on ACV and efficiency. "Infer made it easy to have reliable, predictive intel on our new leads"
The onboarding and implementation process were simple - they were integrated into our Salesforce instance within a week - and their team helped make every step of the process smooth and easy. In addition, the data isn't smoke and mirrors - we've tested our scoring against the feedback were getting from sales and it's mostly in agreement with the occasional (to be expected) outlier. This will help us find the right people to talk to and increase the efficiency of our sales and marketing teams a great deal. There's nothing I particularly dislike. We're getting a good return on our spend. It will be interesting to see how well lead scoring that is based on our historical performance works when we're trying to reach new markets where we don't have much history. There should be enough external markers that we still get a read, but we'll certainly be testing it. We've gotten much better at handling new leads, knowing that we can, with confidence, focus more effort on the leads that are the most promising. We've gotten very good initial feedback from sales that this process has been helpful and they're seeing more actual opportunities than they would have otherwise mined. "Highly effective lead scoring tool that's super easy to integrate"
We loved how easy it was to integrate - we could start using it immediately! We've also received a really great level of support from the team at Infer. We don't dislike anything about Infer but one thing i'd ask for is improved integration with Hubspot. Infer is bringing great benefits to several areas of our business. We've been able to more effectively track and measure quality leads. This enables us to optimize our marketing activity and spend sales team time more efficiently. "Very satisfied with Infer so far!" Infer has done a great job of working closely with use to score our lead database. We ramped up very quickly and rolled out multiple scoring models in less than two months. The team at Infer has been responsive, prompt, knowledgeable, and helpful along the way. Our challenges with Infer have been in successfully operationalizing the product and seeing sales lift. While we got the scoring up and running very quickly, we have been working closely with Infer to make sure we realize the full benefit of the platform and see sustainable sales lift from lead scoring. At Signpost, we work with a large volume of leads. It's important for us to be able to use the best techniques available to identify what's worth pursuing and prioritizing those. Infer fits right in with that goal, and has helped us remove the worst-performing leads out of our system. "Infer makes our funnel measurable and predictable"
We get opportunity scores very quickly and retraining with additional data is fast and easy. We have multiple products and deployment options available to our customers, Infer's scoring takes this into account easily. This makes it possible to measure the quality of our marketing channels by tying the quality of leads generated back to campaigns. It'd be useful to have more detailed insight on an individual opportunity rather than just in aggregate. We use Infer to understand our top of funnel pipeline to measure and score marketing activity. Additionally, the scoring is utilized in our forecasting and goal setting. "Best lead prediction vendor for B2B"
2. Customer support has been highest caliber during POC and after signing the contract. Our point of contact at Infer - I will call him JM - has been extremely resourceful, patient with our questions, and highly responsive. My favorite thing about Infer is how easily it helps us manage a very very noisy top of the funnel. Because our software is so popular, it can be tough for my team to figure out which inbound leads to spend time on, and Infer helps us easily filter through them all. There really hasn't been much to complain about. We were an early adopter of predictive, and Infer has grown with our business every step of the way over the past three years. When any questions come up, their stellar customer success team responds lightening fast to ensure we are both supported and successful. Predictive scoring is a great way for any business to use data as a competitive advantage. To do so, it’s important to help your reps gain confidence in the scores. Once you show how you’re increasing conversation rates, MQLs, etc., reps will naturally start trusting the predictive power of the scores. Because of the free trials we offer for both consumers and enterprises, we’re not working through a cone shaped customer funnel like most companies -- our funnel is more top-heavy. Infer makes our lives so much easier by showing us which prospects are great and keeping those that simply aren’t a fit out of Salesforce. As a result, we’ve seen the volume of qualified leads coming into sales increase by 3x, with our highest-scored leads converting 7.4x more than average. "Great product, great support, great results!" The Infer team was able to develop an impressively accurate lead scoring model for us, focused to B2B sales within the small-to-medium business space without any vertical market or geographical consistency, with comparatively less data than others require. THIS WAS NO SMALL CHALLENGE! I talked with all of the other providers, and not only did Infer have the confidence to step up to the plate, they hit a home run! The only thing I would like to see improved is the charts, graphics, and reporting within the portal. Some of the impact of the science can be achieved through graphic representation. Make sure whoever you partner with takes the time to truly understand your business model and what results you are seeking to accomplish with their product. The Infer team did this from day one. We had a unique challenge and opportunity and they have helped us overcome it and deliver results! We had thousands of accounts that had purchased from us in the past. However, we were expanding into a new product and service that those accounts had not purchased from us previously. So we had tens of thousands of contacts but no way of effectively analyzing and prioritizing them for targeting with this new product and service. With the Infer model, we have been able to effectively score our existing account base and clearly see which accounts and contacts should be prioritized for marketing these new services. We have seen increases in appointment setting, opportunity generation, and won deals. "Infer allows our SDR and Sales Ops teams to easily priortize the highest value leads + signups"
The premise of Infer is vastly superior to 'old school lead scoring systems', which are typically built based on the end users assumptions of 'what a good lead looks like', instead of the data around which leads have actually converted for your organization in the past. It's also a super easy product to instrument + use. There are a few issues I have with the way their SFDC <> Infer Backend happens - instead of instantly querying Infer for the appropriate score each time a lead is created (based on an apex trigger in SFDC), Infer queries our SFDC DB every 5 minutes to identify new leads. This creates a tiny additional delay between leads being created and followed up on that I would like to improve (this is a super nitpicky issue, I realize). I also tested their "Smart Signals" product against Clearbit and found that Smart Signals data was slightly less accurate and slightly less comprehensive. We needed to streamline our signup -> Contacted by sales process, and Infer was a crucial piece of rebuilding that system. The benefits are substantially increased engagement with our top signups (60%+ connect rate compared to 25% historically), improved clarity into what our ideal customer profile is, and data that we can use to shape product decisions and our overall GTM strategy. Besides providing one of the most advanced and effective technological solutions for lead generation marketing and sales optimization. The support and treatment we received (and still receiving) from Infer is extremely professional and heartwarming. 1. Improved our sales development process by helping focus on the leads that count and are more likely to close. "Great fit scoring, stops the guesswork." We recently implemented the marketing automation connector with Infer and I am excited to see how this increases our agility with Infer scoring and workflow. We've had to adjust some workflows to handle Infer changes when data values change later on. This isn't a problem with Infer but with challenges with our settings. Getting the right leads prioritized and into the hands of our ADR team. What isn't to like about Infer? The part that has been most eye opening and best for us is the amount of activity that is taking place on leads that are going nowhere. For our team, we've adjusted almost all of our goals to be in line with what we're seeing in Infer. Our marketing team now runs our goals off of increasing the amount of A & B Leads scored through Infer but also increasing the Infer score number as well. With the renewed focus on increasing the quality of the leads, the rest of the team knows that from the beginning we're only focusing on the right people as opposed to just increasing numbers because big numbers look good. Because our team is united in this cause we all understand how important each lead is. For our BD team this tool has solved the ever back and forth drama of "how are the leads today" - now we know each day what the expectation is for both lead volume but for lead follow up. We've been able to easily put Infer into all of our key processes as a marketing team and won't ever look back! Installation and onboarding was one of the easiest I've ever done! Make sure that when you do your evaluations of predictive software that you're putting all vendors on the same playing field and making sure that you're not giving one or another preferential treatment with your data. Give the vendors a sample size of six months of data. Split the data out and give them a "training" set of data that lets the model train itself. Then give a blank version for the vendor to fill out with their data model. Keep the answers for yourself and when it's time to evaluate how well the model did, compare them on an even basis. Talk with the Infer team about this as it's extremely important to find out who's math is going to work best for your team! We're solving the problem of prioritization of leads, scoring quality, and also understanding what roles and profiles are applicable to our business. We bought infer with the purpose of prioritization, but have been able to solve so many other problems with just a number and a letter! "Completely changed our process and gave us 10x faster feedback"
Great product and technology and amazing support from the team. We were an early customer and were completely blown away with how quickly the model was built and how effective it has been at predicting likelihood to be a good customer. No dislikes on the product per se. Infer is expanding to help us with "top-of-the-funnel" activities like bringing in more high-quality leads which is great. If you are looking for a solution to quickly prioritize incoming leads, or to go find more high-quality leads, this is a great product. There are dozens of companies that have "predictive analytics" in the product description. We have found Infer to be the best for our needs. They will go head-to-head with any alternative and win. Within seconds of a lead coming through, we know who we should focus on. It has helped us scale our business without just adding people. The strength of Infer is the validity of the model. Isn't that why we're using scoring as marketers to begin with? It's been my assertion since I first started down the predictive lead scoring path in 2013 that the company with the best modeling is going to win, and for us that has been Infer. We've tested other lead scoring vendors, some of which are more credible than others, but over time Infer's model has absolutely proven itself. Infer has kept its focus on predictive lead scoring (mostly based on profile) and hasn't drifted into broader service offerings (like demand gen applications - finding leads in the market who may not know you) but to their credit they've acknowledged where their core competencies lie and not tried to over-promise and under-deliver in other areas. I wouldn't say there is anything I particularly dislike. 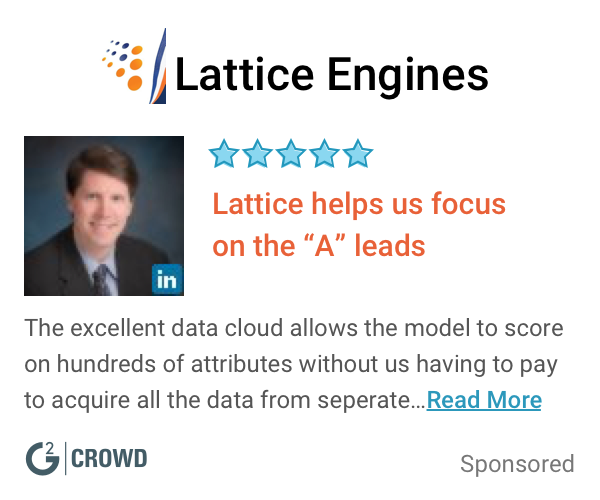 I would love to have the success we've had with lead scoring applied to broader parts of our business like demand gen and data appending, but to Infer's credit those broader services are not their core competencies and I respect the fact that they want to stick with where they know they can be successful. A lot of people talk about UI for predictive models and being able to expose predictive variables to the organization, and wanting to see more of that, but a lot of that point of view reflects the fact that many marketers and sales professional quite frankly don't understand how these models work, so it's a bit of a red herring. I don't get wrapped around the axle with UI because it's not an individual variable that is predictive, it's a combination of different variables with different weighting and the way they interact that's predictive, which is hard to boil down and represent in a UI. I think Infer's UI is fine - their slider is the best part. People looking at Infer and similar vendors need to do the back-test trial. Infer's staff is straight-up in what they build and honest in how they anticipate it will roll into production. We tested another vendor who essentially gamed the system during the back-test by using variables that would not work well in production. They did this by using variables that have information/data that is acquired over time, essentially by a lead or contact being worked by a sales or market development team and augmenting that variable with data that is highly useful in building a model. But that data is not available when a lead first comes in, so this vendor's model failed miserably in production. Basically, as buyer you need to be diligent in reference checking. Also, don't get sucked in by the UI - see my previous comments on that. The UI is useful, but the good models are highly complex - that's what makes them good. Infer's models are so much better than what comes out of the box in marketing automation - don't even go down that path if you're a serious marketer. But because they models are complex, trying to surface "magic predictor 1 and magic predictor 2" is just not realistic. If it were that easy, you could do it yourself. Test the model, work with Infer, and you'll be fine. Be a critical consumer of the other vendors. There are one or two others out there that are credible, and a bunch that I think are so lost they don't know just how bad they are. My part of the business is SMB, and we have a strong content play with free content and a high volume of campaigns and inbound leads. We use Infer for lead prioritization as well as understanding what leads / contacts are in our database and how valuable they are, and using that to guide our targeting decisions. We've recently taken lead scoring and Infer's model further to integrate it into our SEM bidding platform. The benefits have been clear - we're able to follow-up on the top leads and not get bogged down trying to follow-up on tens of thousands of leads and campaign responses that are low to zero probability buyers. It's important to note that Infer won't identify when someone is in a buying cycle, just that they're a good fit - so presumably the highly scored leads/accounts have a high probability of one day buying, but not necessarily at that moment in time. But I can share this: virtually the only companies that buy in any given period of time have a medium to high Infer score. Leads at the 50th percentile and lower almost never buy. So while we can't say that a lead scored in the 90th percentile, for instance, will buy today or tomorrow or next year, we can definitively say that a lead in the 10th or 20th percentile will never buy. And that insight has been invaluable. It's allowed us to help keep our market development costs down, helped us with lead routing and triage, and given us insight as to what campaigns, vendors and tactics are giving us the best yield. Infer is easy to work with and has a genuine interest in the success of our business. They feel like a partner. It would be nice to have some more self service features and get more in-depth self service reporting. We use Infer to prioritize outreach and marketing, as well as set up our territories. Thanks for leaving us a review and being a terrific customer. "Infer helps me bubble up the right accounts and clear out the wrong ones. " There are a lot of competitors to the space that are popping up recently. I'd like to stay armed (proactively) with insight about what makes Infer the best option for me to stay with. We are very lucky to be overloaded with inbound domains into our database. That's a GREAT problem to have - but an efficiency problem nonetheless. Infer has helped my operations efforts in bubbling up the good fit accounts and keeping the bad fit accounts out of view. Without it, they would all be mixed together and it would be much harder - dare I say impossible - for my reps to use their time wisely. "Predictive drives go to market results"
The predictive models that Infer built for us have made our marketing and sales machine much more efficient. I was pleasantly surprised by how quickly we were able to implement the solution. While there are other solutions in the market with good predictive models, the Infer team has been a pleasure to work with. As our go-to-market strategy has evolved, the Infer team has been there with us. A common challenge with machine learning-based models is that they are somewhat opaque. The Infer portal highlights some of the key signals in the model, as well as the biggest drivers of any individual score. I'd love to have an easier way to share these insights with the broader sales and marketing teams, as anything that helps drive adoption will make the solution more successful. Make sure to consider post-sales support when evaluating any predictive solution. The Infer team has been committed to our success since day 1. We initially implemented the solution to drive efficiency on the BDR team. We were able to immediately identify and suppress a significant portion of our lead flow that was low value and not driving much pipeline. We've since adopted an account-based scoring model that is helping to drive our account-based marketing and sales strategy. "Huge returns on their automated account modeling"
Infer does a great job with historical data, but often we're expanding to new verticals and types of companies. Those new kinds of companies are often scored lower then we'd like. It would be great to be able to provide some manual inputs into the model. If you're processing inbound leads, then a lead/contact model is best. For our account marketing strategy, we stuck with an account model. IF you truly want to get the most out of Infer, tie the infer grades into your sales comp system to incentivize use of the model. We're increasing our conversion rates with infer by having our sales resources focused on accounts that are more likely to close and have opportunities for expansion. "Phenomenal solution for marketers and I expect it to continue to grow"
Predictive lead scoring gives me the ability to do things I've never been able to do before - measure campaign performance without waiting months, evaluate reps against one another, and most importantly focus my team on the most critical leads. It's the greatest list of "cherry picked" leads I've ever seen! We've been using Infer for almost six months now and I can comfortably say we are out of the honeymoon period, but still thrilled with the solution. In addition, their customer service is ABSOLUTELY INCREDIBLE. They are an extension of the team and more than willing to think through problems and solutions with their customers - a big improvement over traditional vendors I'm used to. Infer is incredible at scoring a leads "fit" for your product or service, however it leaves some room for improvement in the "interest" department. We want to focus our sales efforts on high quality leads who are interested. For the folks that are not yet interested, marketing needs to nurture for future results. I believe they are working on building a solution to this (beyond the overly simplistic solutions of Marketo, Pardot, Eloqua, etc.) but its not GA or available for all platforms. It was also expensive to purchase at first, but the ROI is overwhelming. Just something to think about when budgeting. * Make sure you partner with a company who will back you throughout the process and ongoing - Infer is excellent at this. * Understand the effectiveness of any "predictive" companies algorithms - this will have a huge impact on your results. * Talk to other customers - they'll give you a real perspective on what their experience has been like. Within 30 days, we had increased sales pipeline 4.5X and increased our ASP by almost 200%. This step function improvement has been continuous as well - not something that jumped up and came back to earth slowly. We've actually been able to tackle a *massive* number of leads by only focusing on the ones we believe are worth our time. "Predictive Analytics at its best!" Infer makes it easy for sales reps to focus on the leads with the highest probability of turning into closing opportunities by hiding all the science behind the curtain and just showing a rating/grade to the end user. They worry about the formula and the math and reps can focus on following up with the best leads. Not a dislike or complaint but in order to maximize the scoring formula, you need to involve Infer's implementation team (who are terrific!) and their expertise to make optimize all the inputs and signals. Other companies claim to provide the same functionality that Infer does but nobody comes close. Their predictive technology is head and shoulder above what any competitors may claim to be able to do. The implementation team is top notch, not only in their understanding of the product, but in their understanding of the predictive scoring arena. Infer solves the very real sales question of "which leads should I call first?". Using smart signals and historical information, Infer makes it dead simple for Reps to identify and follow-up with the highest quality leads that are most likely to turn into won deals. * We monitor all Infer reviews to prevent fraudulent reviews and keep review quality high. We do not post reviews by company employees or direct competitors. Validated reviews require the user to submit a screenshot of the product containing their user ID, in order to verify a user is an actual user of the product. Hi there! Are you looking to implement a solution like Infer?